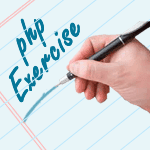 Write a PHP script to display source code of a webpage (e.g. "http://www.example.com/"). Webpage: A web page is a document that is suitable for the World Wide Web and web browsers. A web browser displays a web page on a monitor or mobile device. The web page usually means what is visible, but the term may also refer to a computer file, usually written in HTML or a comparable markup language. Web browsers coordinate various web resource elements for the written web page, such as style sheets, scripts, and images, to present the web page. Previous: Write a e PHP script to display string, values within a table. Next: Write a PHP script to get last modified information of a file.